An album that long term followers of Pavlov's Dog will be delighted to add to their collection. Hot on the heels of their excellent new studio album 'Echo & Boo', (their first for two decades, which is also reviewed this issue) comes the first official live release from Pavlov's Dog. Recorded during the band's 2009 tour, 'Live And Unleashed' is an excellent selection of tracks covering the band's career, as well as main-man David Surkamp's solo output, with songs selected from each of the five Pavlov's Dog studio albums, two from Surkamp's 'Dancing On The Edge Of A Teacup', as well as the song 'Heart Of Mine' which comes from Surkamp's HIFI project with Ian Matthews (Matthews Southern Comfort). Not surprisingly the set plunders the band's debut and the most recent Pavlov's Dog album with most frequency, with four songs coming from each and considering that there is a mammoth thirty five years between 'Pampered Menial' and 'Echo & Boo', the whole set runs with an amazing continuity. One of the first things always mentioned when Pavlov's Dog comes up is David Surkamp's (in)famous high pitched warbling voice, which is either seen as huge attraction, or a complete turn off. I have to say that I find his style to be mesmerising and live it is an even more powerful force than I had expected. Having said that there is the odd occasion where he does seem to scream rather than sing, but surprisingly it actually increases the impact of the songs. The inspiration all comes from the same seventies rock style base, although what does make Pavlov's Dog stand out is the infusion of folk vibes, with a progressive bent and this aspect also comes over really well on 'Live And Unleashed'. Kicking off with the pairing of 'Preludin' and 'Of Once And Future Kings' from 1975's 'Pampered Menial' beautifully eases the band into the show with some fine violin work from Abbie Hainz, before some mad off-kilter guitar and keyboard work segues into the gentle melancholy of 'Of Once...'. The melancholy is quickly replaced with some quick fire almost rag time piano and in the space of five minutes, Pavlov's Dog have perfectly summed up the wonderful, weird world that they inhabit. The other two songs from 'Pampered...' (Late November' and 'Episode') are also delivered beautifully, but it is the later output from the band that really comes alive here, with 'I Don't Need Magic' and the closing pairing of 'Angeline' and 'Angel's Twilight Jump', from the, at the time, still to be released 'Echo & Boo', that dazzle and sparkle with a vibrancy that is completely captivating. The gently funky feel of the aforementioned 'Heart Of Mine' from HIFI and 'Looking For My Shadow' and 'Wrong' from Surkamp's 2006 solo release are welcome additions. The latter sees Surkamp's wife Sara handle lead vocals and reveal an amazingly rich, bluesy voice that has a depth and clarity seldom heard, is quite startling. 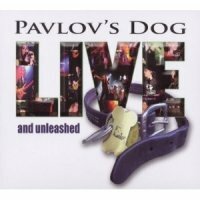 'Live And Unleashed' is an album that long term followers of Pavlov's Dog will be delighted to add to their collection and as an introduction to the band is quite wonderful.